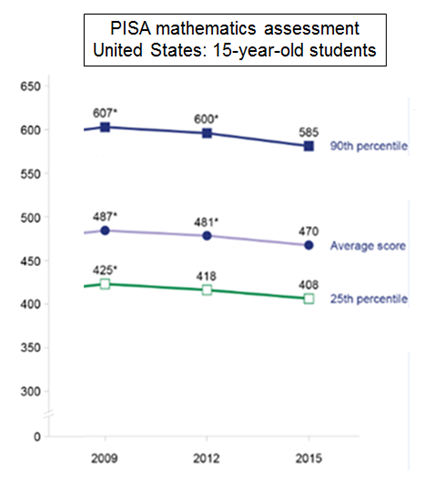 Students attending schools with a majority of well-to-do students score near or above the OECD average. 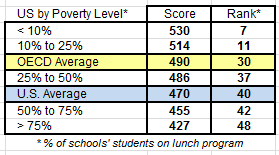 Students attending schools with a majority of impoverished students score far below the OECD average. U.S. ranks #40 … Canada ranks #10 …. what’s up with that, eh? This entry was posted on December 6, 2018 at 6:59 am and is filed under Education - Academics, IQ - IQ Scores, Math & Quant Skills. You can follow any responses to this entry through the RSS 2.0 feed. You can leave a response, or trackback from your own site.